So tomorrow night we're off to London to see 'Celebrate Otis Redding' at Pizza Express Live in Holborn. 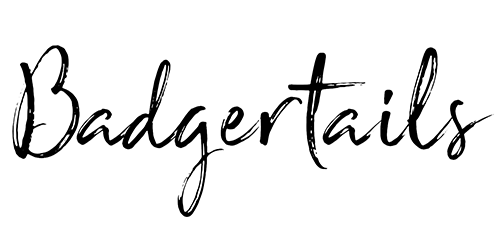 I'd started putting together a wardrobe post, then I realised that really this is the perfect outfit for what we're doing tomorrow. It's forecast to be a rainy day, but that's ok because these outfits conjure up all the romantic notions of dashing from cab to cafe sheltering from the heavy English downpour under a shared umbrella with your beaux. And later on, after dinner, darting down the stairs of a low-lit jazz club, removing your cloak while you order a French 75 cocktail at the bar. All the while feeling safe and warm in your underground sanctury while the rain drizzles down outside. 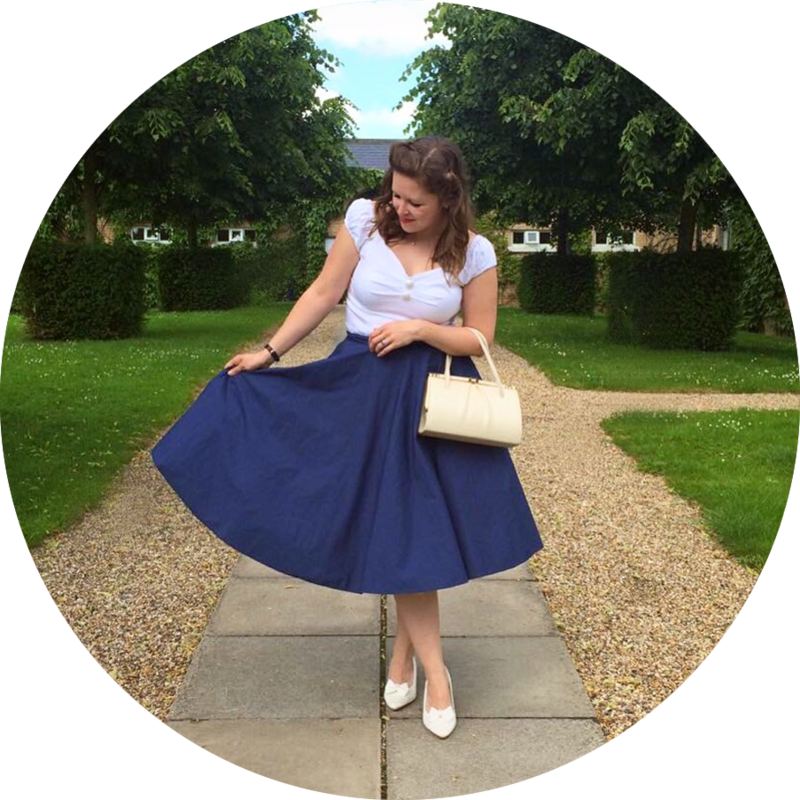 This magnificent skirt is the work of vintage extroardinare, Miss Victory Violet in her collaboration with stunning retro clothing brand Voodoo Vixen. 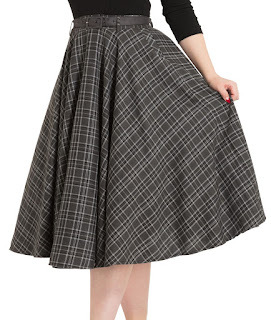 I fell pretty hard when I first saw this skirt, it's just the perfect winter staple for any retro wardrobe. It also has that wonderful ability to flit flawlessly from day to night - so here I've paired two looks to showcase this nifty number. A black rollneck is one of my essentials, and works especially well for smartening up a more casual look. 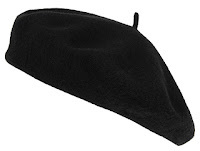 It also adds a hint of vintage sophistication - and even offers a beatnik vibe when paired with a beret! Super versatile, super toasty, super classic. 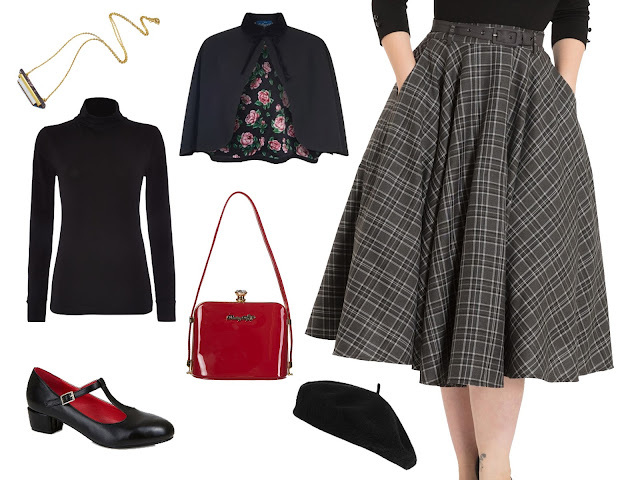 Keeping it comfy for daytime, I'd wear this with low-heeled Mary-Janes by Lulu Hun and why not - lets bring in those beatnik feels with a simple black beret from Accessorize! Lastly, to finish the look off, this gorgeous cape from Collectif Clothing adds the perfect touch of retro chic, and this unique Wolf & Moon necklace gives a warming dash of gold to the dark and moody tones in the outfit. And to top it off, a striking pop of colour; this deep red bag with gold coloured metal by Dancing Days for all your retro essentials, is such a lovely shade - the cherry on the cake! 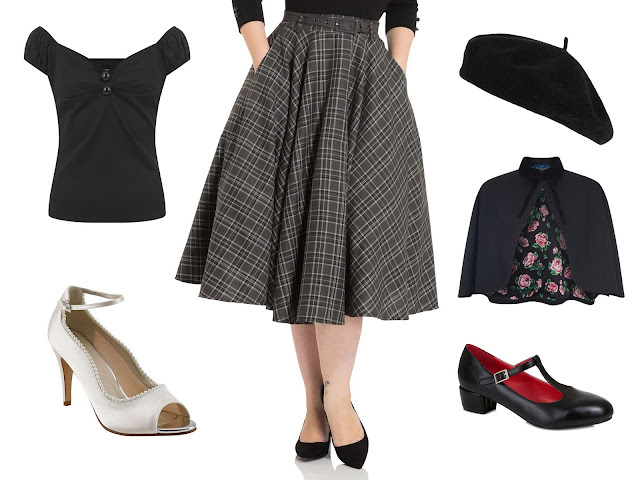 Look number two is a dressier look, perfect for an evening of late night jazz in the West End, I'd team the Bridget skirt with another of my staples, the Dolores top by Collectif. 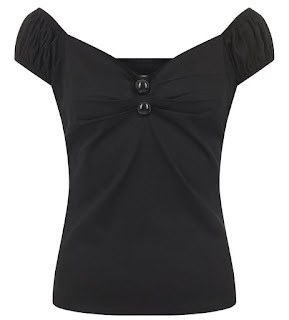 I've got this in a few different styles already as it's just so versatile and super flattering. It’s also a style that you can easily dress up or down, and for any season. 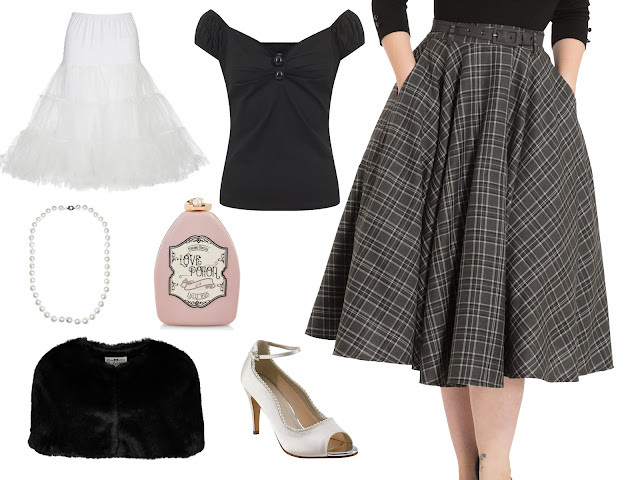 To give this look that touch of vintage glamour, luxurious faux fur and crisp white pearls are the perfect accompaniment. This classic pearl necklace from Collectif twins beautifully with the pearl trim on these fab Rainbow Club shoes, below. Ok, so they’re wedding shoes – but if they’re designed to make a girl feel like a princess, then why save them for just one day!? 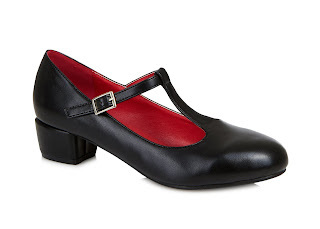 These shoes are the epitome of timeless elegance and the peep toe gives a nod to retro styling too. 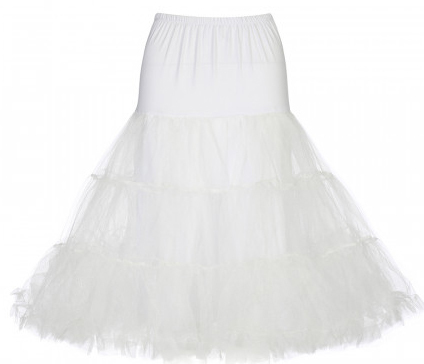 To obtain the ultimate fairytale feel, I'd team the skirt with a white petticoat like this one from Lindy Bop. There's something to be said for slipping a big blousy petticoat on underneath a swishy swing skirt - no matter how many times I do it, it still takes me straight back to stepping into my fishtail wedding dress all those years ago. And the icing on the cake this time is this adorable Lulu Hun 'Love Potion' bag - the silky shade of blush pink is so feminine against the greys and whites and really softens the whole look - plus the cute label is great for date night!